This brachiopod is one of the most common in the Logan Formation of Wooster, Ohio, so our students know it well from outcrops in Spangler Park and the occasional excavations in town. Four specimens of Syringothyris Winchell 1863 are visible in the slab above. The critter in the upper left is an earlier Fossil of the Week: the bivalve Aviculopecten subcardiformis. This suite of fossils is about 345 million years old (Osagean Series of the Lower Carboniferous). 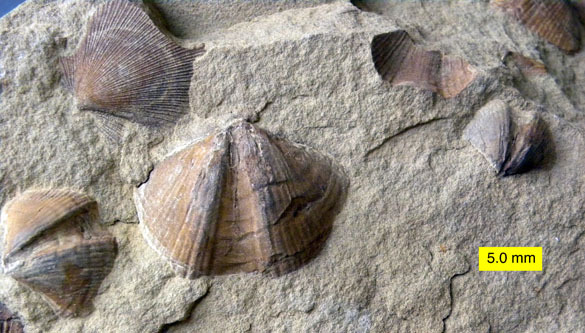 We can’t identify the species of these Logan Formation brachiopods because the original shells dissolved away long ago. We are left with the sediment that filled the insides of the shells, producing what paleontologists call internal molds. Syringothyris belongs to the Order Spiriferinida, a group of elongate brachiopods that are punctate, meaning there are tiny holes penetrating their shells. Unfortunately this is one feature I can’t show you with internal molds! Alexander Winchell (1824-1891) named and first described the genus Syringothyris. He was a geology professor at the University of Michigan for decades, specializing in Lower Carboniferous stratigraphy and paleontology. He was also the state geologist of Michigan. 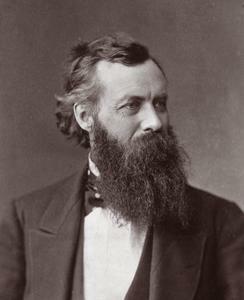 Winchell was one of the early American Darwinists, working hard to reconcile religion and science in the United States (with decidedly mixed results! ).